In association with the Essex Record Office (ERO), Tim Fransen has developed an open access high-resolution interactive version of the Chapman and André's Map of Essex 1777 using digitised plates from the ERO publication No.11, 1950. To extend the ERO publication's intention 'to enable a wide public to enjoy this remarkable map' this online version supports all modern web browsers, platforms and devices for the benefit of students, teachers, historians, researchers and other interested people. Please visit: map-of-essex.uk to explore and enjoy. This page was added by Tim Fransen on 08/03/2018. Hi Tim, sorry about the late publication of the comment immediately below - it came about 10 days ago. I've had nightmare experiences with Windows 10 and Linux Mint that are now past so I've been able to resurface today. 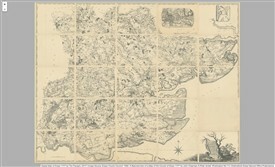 I have produced 'Version 2' of the Map of Essex 1777 based on the original 18th-century atlas of twenty-five engraved sheets. I hope you enjoy exploring and please share widely. * 'Free' thanks to Rochford Parish Council and the generous sponsorship from Caremark. It would have been quite a shock seeing the original engravings for the first time if you have only ever seen the later copies. The originals are truly stunning in the amount and clarity of detail they have, I can well remember the first time I saw them myself. Having the later copies on-line is a wonderful historic resource that I will no-doubt use quite a lot in my historical research so thank you, but to have a high resolution digitised version of the originals would be simply amazing. Hello Brian, Bob and RDCA readers, thank you for your comments – good to know you’re enjoying the digital map and finding it useful. Maybe so Brian but the detail still looks impressive. which turns out to be another recreation of the originals (but without hanchures to show gradients), and which is available at considerable cost. Some useful associated information is provided about the Chapman and André editions. Has anyone had a go recently at a full colour digitisation of any of the original coloured versions of the maps? Might be nice to have one of our local area in Essex. Very useful thanks for the link. It is a shame that he had to use the 1950 re-print and was not able to use an original 1777 printing. The original that was printed with the original copper plates has far more detail than the 1950 re-print that used a photo type process to copy an original and as a result lost some detail and also lost some edges of the original maps.